Politics • Saratoga Springs mayor makes D.C. rounds. 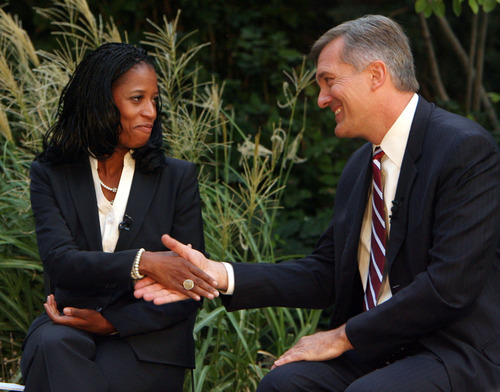 Trent Nelson | Tribune file photo Saratoga Springs Mayor Mia Love says the federal government's impending spending cuts won't hurt her city Steve Griffin | Tribune file photo GOP challenger Mia Love and Democratic Congressman Jim Matheson shake hands during a television debate in September. Matheson won the election by a whisker and also prevailed in the fundraising contest by a narrow margin. 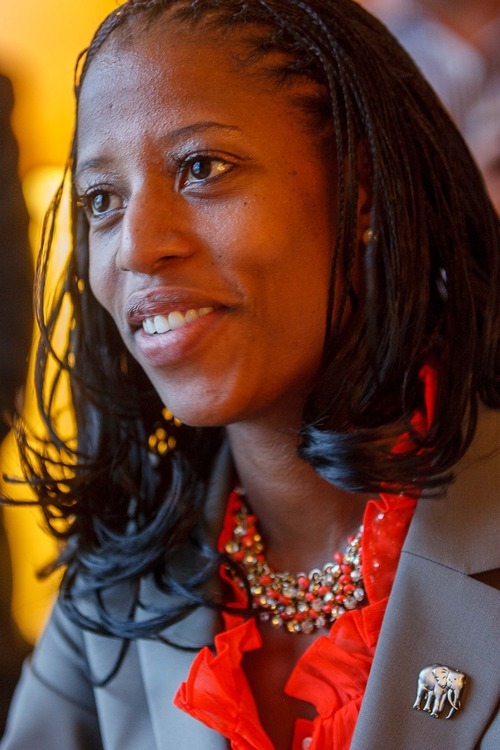 Washington • Saratoga Springs Mayor Mia Love says she&apos;s considering a rematch against Democratic Rep. Jim Matheson, whom she lost to in November by just over 700 votes. "We&apos;re seriously looking at it again," Love told The Salt Lake Tribune in an interview before her appearance at the Conservative Political Action Conference near Washington. Americans&apos; "struggles haven&apos;t gotten any better, the environment in Washington hasn&apos;t gotten any better. ... We need people who are going to be leaders, people who are going to do something about it." Love was considered a rising Republican star last year, earning a speaking role at the party&apos;s national convention and help from the GOP&apos;s presidential nominee, Mitt Romney. But Love&apos;s bid fell short despite a large Republican turnout in Utah and a new district for Matheson, who jumped from the 2nd Congressional District to a newly created one. Love, who also recently appeared on ABC News&apos; "This Week with George Stephanopolous," says she&apos;s not sure yet if she&apos;ll run for Congress again but promises that she won&apos;t seek another term as mayor if she does. She says her first bid taught her a lot. "There are a lot of things to do differently and there are a lot of things we did that worked," Love said. "I get to start from a completely different place." Love&apos;s name is much more well-known after her first bid, though it&apos;s likely to be a big challenge to overcome a loss in a year when Romney headed the ticket and Matheson faced a new electorate. In anticipation of a run, Love has hired Dave Hansen, a Republican strategist and former Utah GOP chairman who successfully ran Sen. Orrin Hatch&apos;s re-election. Matheson said Saturday that he&apos;s surprised Love is already planning another bid. "It&apos;s awfully early to be talking about that," Matheson said in an interview. "We just finished an election and I think most folks I talk to are tired of the politicking. They want people to work constructively to get things done." Utah Democratic Party Chairman and state Sen. Jim Dabakis says another Love-Matheson battle will be a "great rematch." "I hope that this time we can focus on Utah and Utah issues and not get into this spiral of negativity that she caused to happen last time," Dabakis said. The conservative audience welcomed Love on Saturday with raucous applause. "Nov. 6 was a tough night for conservatives; it was even a tougher morning when frustration set in, and we looked at what the next few years would do to our principles and values," Love said, noting that some in her own party wanted to "turn tail and run" and regroup later. "Tempting as that may sound, that&apos;s not what we do as freedom-loving Americans. Love said she&apos;s not sure when she&apos;ll make a decision on whether to run, but during her Washington trip she met with officials of the National Republican Congressional Committee, which has targeted Matheson since his first election in 2000. The NRCC has already run online advertisements against Matheson, who in return sent out fundraising letters seeking help to combat the GOP attacks. A conservative Democrat, Matheson has become the top incumbent target of Republicans, though he has beaten back every challenger. Love says she&apos;s ready to fight again, should she jump back into the race.